Handling the death of a loved one is hard enough. Adding real estate issues into the mix can make things even more complicated and painful. If a loved one dies while owning property, something will need to be done to ensure that their property can be handled correctly. How that happens will depend on a number of factors, including whether or not your loved one left a will behind. The situation can become even more complicated if money is still owed on the property or if there are multiple parties claiming a right to the property. In many cases, it is in your best interest to hire a real estate lawyer to help you navigate the complicated real estate law involved in the situation. Whether or not you hire a lawyer, though, it’s a good idea to educate yourself so you know what to expect and how the process is likely to work. If your loved one left behind a will, then the property that they left behind (including their real estate, personal assets, and cash) will be divided according to their wishes. An executor of the will, which can be a lawyer, a member of your family, or someone appointment by the courts, will ensure that the loved one’s final wishes are carried out and will settle their estate. If your loved one left you property but it was still in their name, then you can utilize a process called conveyance to transfer the deed on the property into your name. This is something we help many of our clients with in our New York offices. The will left behind by your loved one will need to be deemed valid by a judge, but once it is, then the rest of the process should be relatively straightforward. If there is no will left behind by your loved one, the situation can be markedly more complicated. Their remaining property (including their real estate, personal assets, and cash) will be divided up according to the law. In most cases, the spouse will automatically inherit the bulk of the estate, with some assets being designated to any children (New York law designates which items are subject to be divided up and which are automatically inherited by the spouse in whole). If there is no spouse and no children, then parents and siblings will be the likely inheritors. If the person passed away with no family, then the property will go to the State of New York, but these cases are very rare; the state will make every effort to locate any living relative (even distant relations) to make beneficiaries of the estate. Inheriting property, either through a will or through the courts, can come with its own set of complications. If you are the spouse, the process is pretty straightforward and you shouldn’t encounter many hurdles when it comes to getting the property transferred into your sole ownership. There are unlikely to be any fees or taxes involved, either. However, if you are a sibling, parent, child, or friend of the deceased and were named in their will as the beneficiary of the property, it can be slightly more complicated and expensive. You’ll probably end up needing to pay taxes on the inheritance depending on how much it’s worth. That goes for real estate and any other inheritance you might receive. New York doesn’t have an inheritance tax, but the federal government may impose an estate tax on the value of the inheritance. Sometimes the taxes involved are high enough that it makes more sense to sell the property rather than to keep it. Make sure you speak to a real estate attorney who has a background in estate planning, too, so you clearly understand the taxes and fees that may be imposed on your inheritance so you can make an educated decision about your next steps. Have Questions About a Property After the Death of Your Loved One? 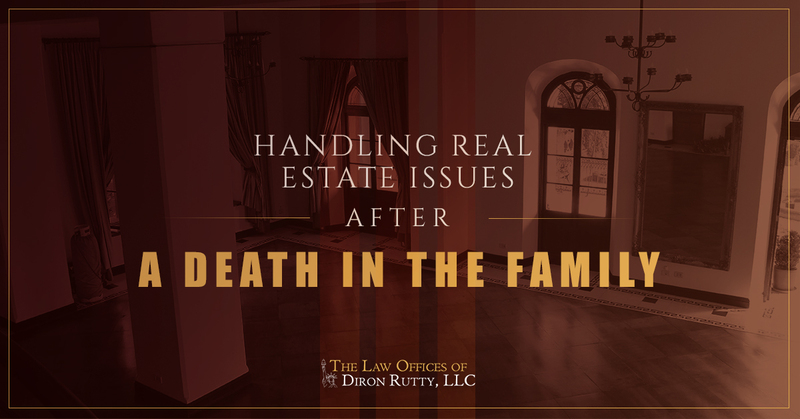 The Law Offices of Diron Rutty, LLC understands that losing a loved one is devastating. We believe that you shouldn’t have to add the stress of real estate complications to your grief. Let out legal team answer your questions and help you find the answers that you need. With experience in conveyance, estate planning, and probate, our team is uniquely suited to help you in this difficult situation. Get in touch with us by giving us a call or contact us through our website. We’ll schedule a complimentary consultation so you can share your situation with us and we can tell you more about how we can help. Let our team guide you through this difficult time and make sure that your loved one’s wishes and your best interests are at the front and center of the situation.